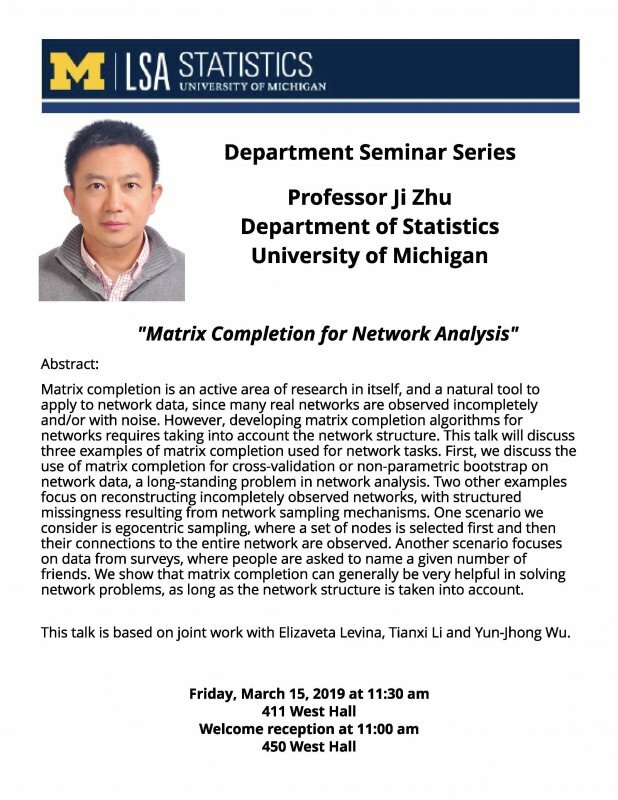 "Matrix Completion for Network Analysis"
Matrix completion is an active area of research in itself, and a natural tool to apply to network data, since many real networks are observed incompletely and/or with noise. However, developing matrix completion algorithms for networks requires taking into account the network structure. 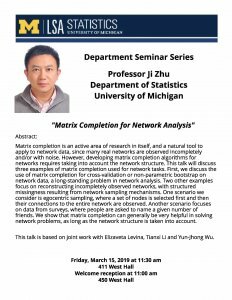 This talk will discuss three examples of matrix completion used for network tasks. First, we discuss the use of matrix completion for cross-validation or non-parametric bootstrap on network data, a long-standing problem in network analysis. Two other examples focus on reconstructing incompletely observed networks, with structured missingness resulting from network sampling mechanisms. One scenario we consider is egocentric sampling, where a set of nodes is selected first and then their connections to the entire network are observed. Another scenario focuses on data from surveys, where people are asked to name a given number of friends. We show that matrix completion can generally be very helpful in solving network problems, as long as the network structure is taken into account. This talk is based on joint work with Elizaveta Levina, Tianxi Li and Yun-Jhong Wu.